Autumn is sweeping over us in a tide of fiery trees and dewy cobwebs bringing a melancholy ripeness to our days. The hot, dry summer has ensured that trees are putting on a particularly dramatic display of autumn colour. Another benefit of the hot summer is that there is a bumper crop of fruit which is all the sweeter for the many hours of sun that they have received. It is not only the countryside folk who have access to this delicious bounty; there is plenty of food to be discovered in our towns and cities if you only know where to look. You don’t have to be a an avid forager either, picking mushrooms from the showers of student halls and braving a patch of stinging nettles every time you want a cup of tea. There is food growing in our parks and on our streets and many great groups and initiatives that are tapping into the harvest. Plums are perhaps not the first thing that you would connect to place-making but the inclusion of productive planting when creating or rejuvenating residential areas can reap benefits from a social, health and economic perspective. The rather difficult to pin down term creating a sense of place is often used by developers and designers and although it is hard to define this concept exactly, a big part of it is about making places that are unique and interesting, and busy with people who feel attached to and take pride in them. It is worth consideration that allotments tick off all of these criteria and inclusion of edible plants within urban planting. When drilling down into what makes people feel an attachment into where they live, inclusion is a key principle - whether this is feeling accepted culturally, knowing ones neighbours or being able to imprint part of our personality into the neighbourhood. Creating the opportunity for people to grow food where they live is a great way to promote social inclusion and contravene antisocial behaviour. Through community initiatives pensioners with a wealth of knowledge can mingle with families with mouths to feed. Recipes can be shared between neighbours of different cultures and people can feel pride in their surroundings. The investment in growing food is an exciting aspect and keeps people stay involved with a project, building social links. A wet April Saturday planting out onions only really becomes worth it when they are dug up in July. The processes of gathering and growing food are so entwined into our ancestry and cultural history that their beneficial effects cannot be underestimated and come as no real surprise. As we become increasing detached from the sources of our food, the importance of reinforcing our relationship with nature is becoming even more critical. Encouraging communities and particularly young people to grow and harvest edible plants in the urban environment is not only broadening and balancing diets but also forging links to the Neolithic hunter gatherers, Bronze Age subsistence farmers and Victorian market gardeners from whom we are descended. It would be neo-luddite to suggest that we should be swapping our smart phones for spades and going down to earth but a healthy and wholesome balance is achievable, spending time out of doors mixing with our neighbours and taking home a varied and delicious range of seasonal produce. Economically, the obvious benefit of growing and collecting our own food is that it much cheaper than buying it in supermarkets. Further, increasing the amount of food grown within the community can help to take pressure off the food-banks that have become a fixture of this age of austerity. The possible negative emotions felt when using a food bank are in sharp contrast to the sense of pride that comes from growing your own food. Historically planting borders in streetscapes were purely aesthetic and/ or acknowledged functional aspects such as maintenance. Making edible plants integral to planting schemes provides opportunity to Landscapes Architects to provide and strive for meaning beyond the aesthetic merits. These ideas are nothing new and indeed there are many great groups and initiatives set up across the country that are taking improving communities’ prospects through the power of productive planting underpinned by an increasing field to fork ethos. Since 2008 when the Incredible Edible movement began in the Yorkshire town of Todmorden the network has expanded to globally with over 100 groups in the UK and over 1000 worldwide. The positive change that this grass roots movement has made from its humble, mill town beginnings is indeed incredible and the wealth of information that is shared across the network is as important a part of their success as the vegetables that are shared out in the communities where it has taken root. Within the twenty-first century, there is an urgency for merging our cities with sustainable food systems, and there are already several landscapes that are starting to provide these needs and are very successful. Lafayette Greens in Detroit is an edible urban garden and park helping to educate the public about health and how to grow food. 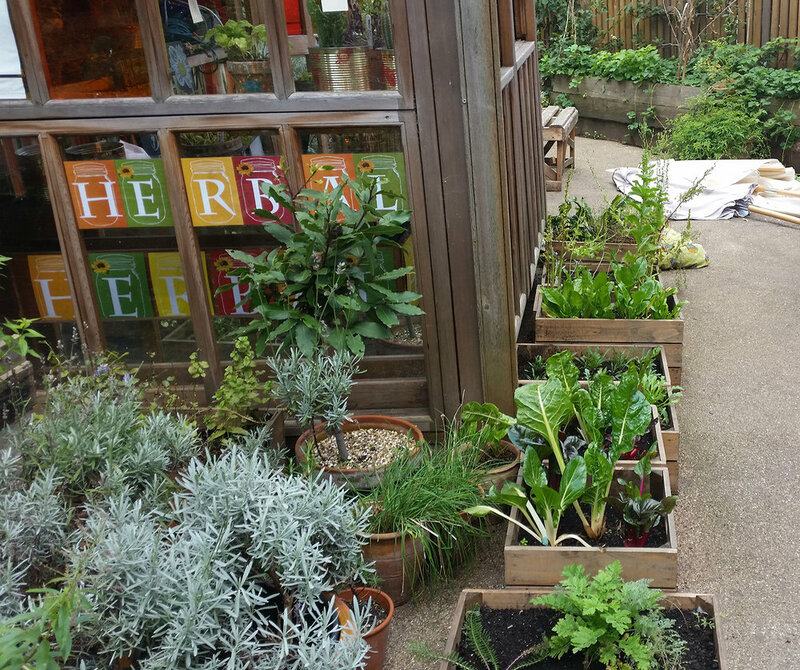 Spaces in the UK such as the Dalston Eastern Curve Garden; once an old railway line is now designed to provide a space for the community allowing people to grow their food, listen to music and engage. Local schools participate in creative workshops and make pizzas with some of the food grown in the garden. One of Exterior architectures very own projects, Chapel down, a proposed Kings Cross Gin Bar & Distillery, sits on the edge of Regents Canal and produces a wide variety of beers and cider, brandy, and gin. The concept was to upgrade the current landscape, keeping in mind the function of the distillery by using a range of berries, fruits and herbs to reflect some of the ingredients that would be used in the brewing process. The planting choice was key providing seasonal interest and educational merit. Planters were designed with the inspiration of brandy barrels with removable trays, allowing different plants to be slotted in at different times of the year. Projects such as this create the opportunity to explore and engage the public more creatively. The need for these agrarian landscapes within the urban fabric has never been greater, proving healthier living and more connected communities. A growing concern is that research suggests that due to intensive farming methods, there are only around one hundred harvests left in UK soils. Samples taken from parks, gardens and allotments in urban areas showed higher levels of carbon and nitrogen and significantly less compaction compared to farmland. With ever-growing concerns of climate change, high food miles are unsustainable whilst Brexit also looks likely to raise the challenges of importing food. Local growing is high on the agenda and urban areas are an important part of the solution. At Exterior Architecture the food calendar plays a key part in our role as phenologists. Through our constant study of seasonal change we kept note of the blackberries ripening exceptionally early this year and observed fig trees putting on an, albeit unsuccessful, second crop, believing that we were in a Mediterranean climate. Our interaction with natural processes is at it’s most pure when we are harvesting and consuming the produce of the land and clinging on to this interaction can allow us to live happier, healthier and more connected lives but also equips as designers with an opportunity to provide meaning beyond aesthetic merits.